Once, for only 35¢ you could give your beloved the gift of sound – in the form of an Amazing Talking-Tape Card. Inexpensive chivalry was not yet dead. This particular example was made by the now defunct White & Wyckoff Manufacturing Company of Holyoke, MA. 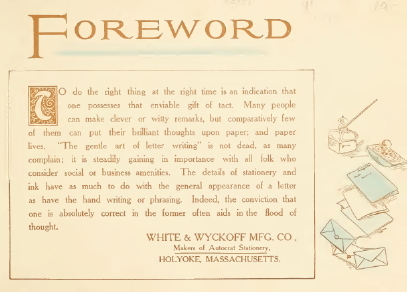 Since 1889, White & Wyckoff had been part of a thriving paper industry in Western Massachusetts towns such as Holyoke and Chicopee. According to the instructions on the back of the package, you tie a knot in one end of the red plastic tape, and insert the other end through the back of the card. Holding the card “in cupped palm of left hand” you draw your thumbnail along the ribbed side of the tape to hear the birdie talk. Here’s a sample: Happy Birthday! This is essentially very simple phonograph technology. As with the grooves in a record, the sound is encoded in the ribs, and the nail of your right thumb acts as a needle. 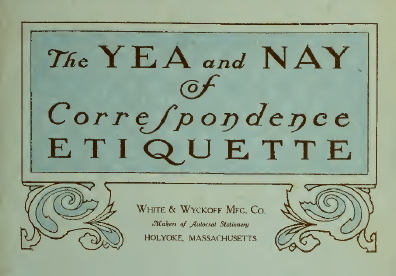 Other extant specimens of White & Wyckoff products include The Yea and Nay of Correspondence Etiquette (1909). Something we can all take a page from these days, I’m sure. I don’t know how common they are – maybe other people are hoarding them. If you ever come across one, let me know.